They are in charge of winter. They behave like a soldier and like an only child. Their hardness is 3. Antarcticite is liquid during the other seasons, but they crystallize during the winter. They also get stronger the colder it gets. While the other Gems are hibernating, they fight the Lunarians together with Kongou-sensei. Since there's only a few sunny days, it's easy to predict when they'll attack. Their job also includes cutting ice floes, since the sound the floes make when scraping each other may bother the sleeping Gems. 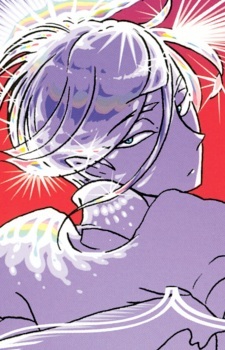 During the Winter arc, they get captured by the Lunarians, which leads to Phos being assigned their old role.